Friday, December 14, 2018 for our annual staff holiday luncheon. 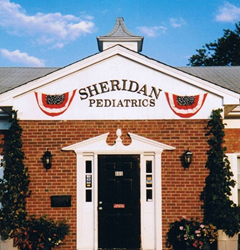 Welcome to the website of Sheridan Pediatrics. We have been at our current location in Amherst since 1993 offering pediatric care for patients 0 -21years of age. With our small-office feel, we pride ourselves in providing personalized attention to each individual. We feel privileged to be a part of your family. Out of concern for the welfare of our patients, particularly infants, we cannot accept new patients who do not immunize on schedule.